When I make soup, it very often is a vegetable-based soup. Here’s a creamy – without the cream – soup that is a welcome variation on carrot-based soups. This one uses carrot, cauliflower, and light miso to blend together. It made a satisfying weeknight dinner soup. Take Melissa Clark’s advice: don’t let the recipe hinder creativity: this is a basic roadmap for infinite variety. Now what else to serve? Wine of course! I chose a Ceretto Arneis, a selection from our Wine Club (notes below the recipe) to pair with the soup. Return the pot to medium heat. Add the oil and heat until warm. Stir in onion; cook stirring occasionally, until soft and lightly colored, 7-10 minutes. Stir in garlic and cook 1 minute. Add carrots, crushed coriander, salt and 6 cups water to the pot. Stir in the miso until it dissolves. Bring mixture to a simmer and cook, uncovered, 5 minutes. Stir in cauliflower and cook, covered over medium-low heat until the vegetables are very tender, about 10 minutes. Remove the soup from heat. Use an immersion blender and puree the soup until smooth. Stir in the lemon zest and lemon juice just before serving. Drizzle with oil and sprinkle with chile, sea salt and cilantro leaves. We joined Tutto Bene Wine and Cheese’s Wine Club last summer and honestly, we have been delighted by some exceptional wines. I don’t think we’ve had one bottle in the last 6 months that we did not love. The Ceretto Arneis is one of those finds we never would have considered on our own. It has a minerally freshness with a slight sparkle that, now that I’ve discovered it, I know I’ll be returning to. The Arneis grape, grown in the Piedemonte region of Italy, were near extinction in the 1960s. Luckily they’ve been rescued! For tasting notes from the vintner and more about this wine, click here. Looking to expand your exposure to some terrific wines? Check out Tutto Bene Wine and Cheese Wine Club here. Recipe downloaded from Mollie Katzen’s website; originally published in Vegetable Heaven. We’re in for a string of 90-plus degree days here in New England. A chilled soup seemed like something that might be light and tasty in the heat and humidity of early September. Be sure to clean the leeks thoroughly! 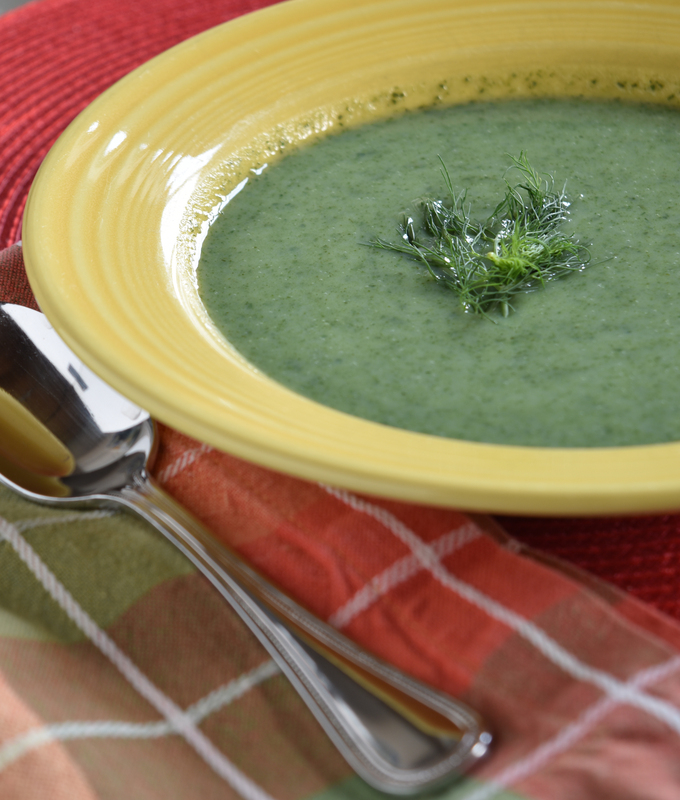 Use a food processor or hand blender to puree the soup with all its solids, adding fresh herbs along the way. You will need to do this in several batches if using a food processor or countertop blender. Puree until very smooth. Transfer to a container, cover tightly and chill. Adapted from Oliver, J. Bread and Tomato Soup. Downloaded from the web on 24 June 2011. My Comment: While it is still too early for farmer’s market tomatoes here in New England, there are still good sources available for fresh and canned tomatoes to use in this recipe. Besides, I had some bread to use up 🙂 Besides being warming and very fresh tasting, I like this recipe because of its simplicity. Never mind that the proportions are metric (a little brain work is good for you!). Enjoy it now and then create it again when the tomatoes are perfectly ripe right off the vine. 1. Prick the cherry tomatoes with a fork and toss with one clove of garlic and about a quarter of the chopped up basil. Drizzle with olive oil, sprinkle with salt and pepper. Put in a roasting tray and cook in the over at 180 c (350 F) for 20 minutes. 2. Heat a glug (Jamie’s term!) of olive oil in a pot and add the remaining garlic and basic stalks. Stir around and gently fry for a minute until softened. Add the canned tomatoes then fill at least one can with water and add that also (you may want to consider adding more water if the soup seems to thick). Break up the tomatoes with a spoon, bring soup to a boil and simmer 15 minutes. 3. Tear the bread into thumb-sized pieces and add them to the pot. Add the torn basil leaves, let the bread sit on top of the soup mixture at low heat for 10 minutes. By this time the cherry tomatoes will have finished roasting — pour them (basil leaves, tomatoes, juices and all) into the soup pot. 4. Give the soup a good stir — you are looking to achieve a thick, silky porridgy texture. Remove from heat, add an additional 6-7 TBSP of olive oil and divide between 4 bowls — garnish with additional basil leaves if you want. My Comment: What better to celebrate Patriot’s Day in Massachusetts than a lovely vegetarian version of French Onion Soup? After all, the French did prove to be very helpful with the Revolutionary War…. This adaptation is my response to taking the beef out of onion soup – it was an experiment of course… but one that we thought was delicious. I’m not a big fan of sticking my dishes under the broiler so technically this is not an onion soup in the French tradition, but it is close. 1. Heat oil in soup pan. Add onions and let them sweat for 30 minutes or so on medium high heat. Stir frequently, adding thyme and salt about half way through. 2. Sprinkle onions with flour. Cook for an additional 2-3 minutes. 3. Add the mushroom broth and simmer. The mixture should appear thicker but not look like gravy! 4. Serve. If desired add a toasted crouton and some shredded cheese to the bowl before ladeling soup over the top. Serves: 4. Weight Watcher Points: TBD.